More than 12 extension were applied on only 3 natural lashes. Natural lashes dropped because it is too heavy. There are reports of many problems relating to eyelash extensions, including: untrained technicians, inexperienced technicians, applying eyelashes in a way that stresses real lashes, using glue not intended for use on skin, using products that contain harmful ingredients, and illnesses caused by improperly sterilized tools. Proper knowledge, a high degree of skill, and meticulous care are absolutely essential in order to apply eyelash extensions to the delicate eye areas. Treatment by an untrained technician is extremely dangerous. 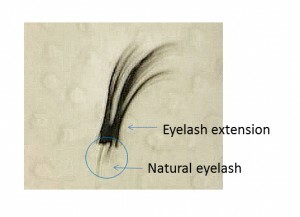 Such problems can be prevented, if the servicing technician has proper training and knowledge, allowing customers to comfortably enjoy eyelash extension services. Artificial nails such as acrylic and gel require adequate coating and maintenance. Improper applications can damage the natural nail, and can also cause green nail syndrome and other nail disorders. Choosing a technician with the right knowledge and skills is most important in order to safely enjoy nails and eyelash extension services. Proper hygiene management is necessary for nail services and eyelash extensions, which require direct skin contact. Of course it is necessary to disinfect hands and always use sanitized tools. It is important to have a proper understanding of disinfecting methods, and to implement them. Some products must be used with caution, depending on their ingredients. It is important to read each product’s cautions, to understand its potential for allergies, to select safe, high-quality products, and use them correctly.